Today's post for the Secret Recipe Club comes from Liz at That Skinny Chick Can Bake. I had such a difficult time choosing a recipe today just because there are so many delicious looking sweet treats! Since Chris and I are trying to eat healthier (which was difficult between birthdays and Valentine's Day), I decided I would go with a savory recipe as opposed to a decadent recipe. I'm sure I'll be back in no time to choose a cookie or cake recipe, though. Chris and I are huge fans of the last quinoa recipe I made, so when I saw this one I wanted to give it a try. Chris loved the other salad, but he's a much bigger fan of lime juice than lemon juice, so it seemed right up his alley. The lime mixes well with the cayenne, which adds a little spice. I love the assortment of vegetables in this dish, between the crunch of the corn, the buttery texture of the avocado and the refreshing juice from the tomatoes, the combination is just right. This is a healthy and tasty recipe you definitely need to try. Enjoy! Cook quinoa using package instructions. Drain and place in large bowl to cool. Combine beans with vinegar, salt and pepper. 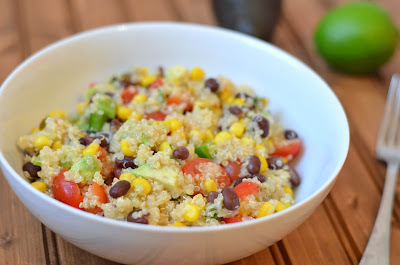 Add to quinoa along with corn, peppers, avocados, tomatoes and cilantro. Gently toss. Make dressing by combining lime juice, salt and cumin. Whisk in oil. Drizzle over salad. Toss to combine. Serve at room temperature. This looks so fresh & delicious! Great SRC choice! What a pretty, colorful, fresh looking dish! Very nice! Oh yum! You're making me so hungry! I've made this before and I love it! I so want to make it again!! What a fantastic looking salad. 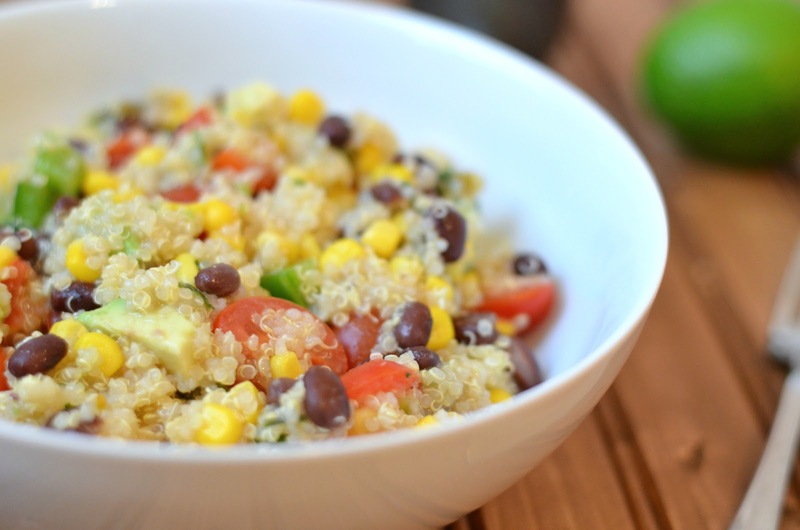 I love quinoa and the other flavors of this salad just sound so delicious. Great SRC choice! I love Liz's blog and this recipe. We've made it a couple of times and thoroughly enjoyed it! The combination of all the flavors sounds so good! And it's pretty too! Great choice. Looks yummy and light! 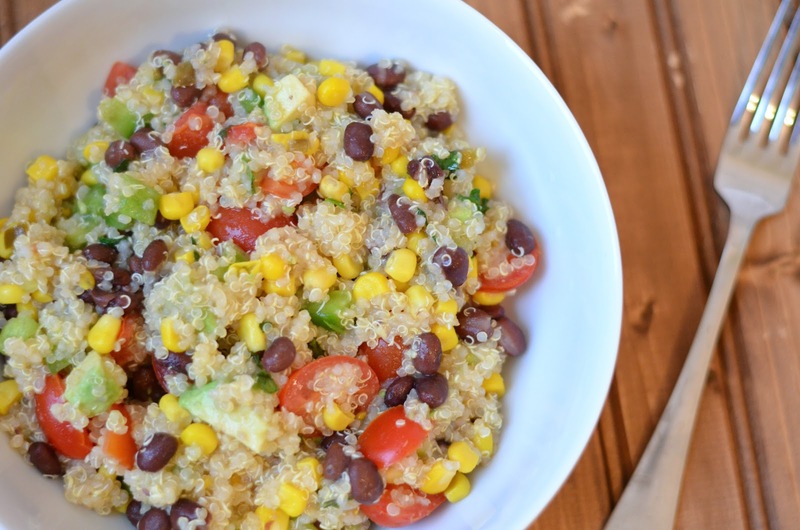 I love the mash up of southwestern flavors with a grain, kind of like a personal burrito bowl at home! I haven't jumped onto the quinoa bandwagon yet but this recipe makes me think I should!